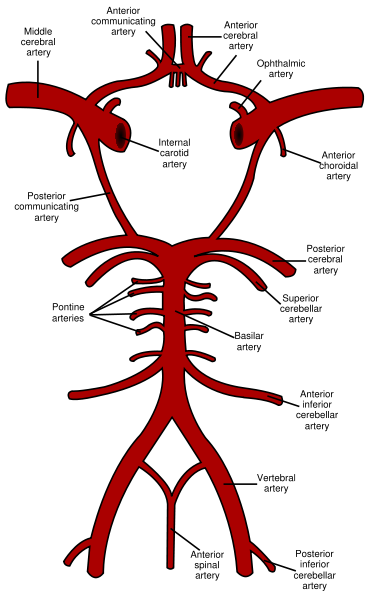 The basilar artery (middle of figure) arises from the vertebral arteries and terminates when it bifurcates in the left and right posterior cerebral arteries. 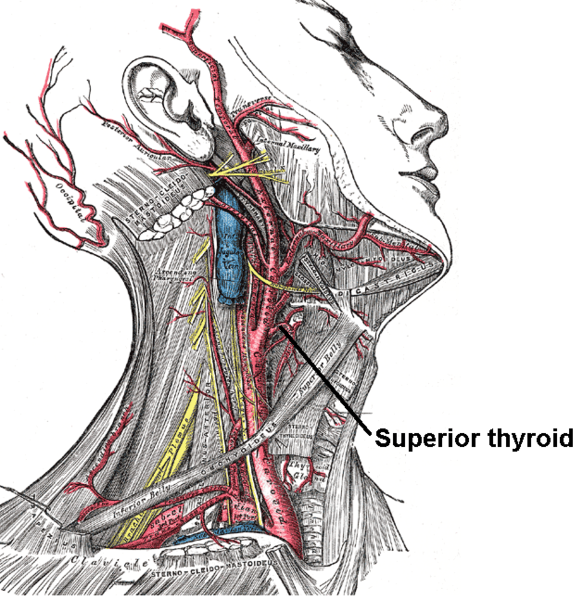 It arises from the confluence of the two vertebral arteries at the junction between the medulla oblongata and the pons. 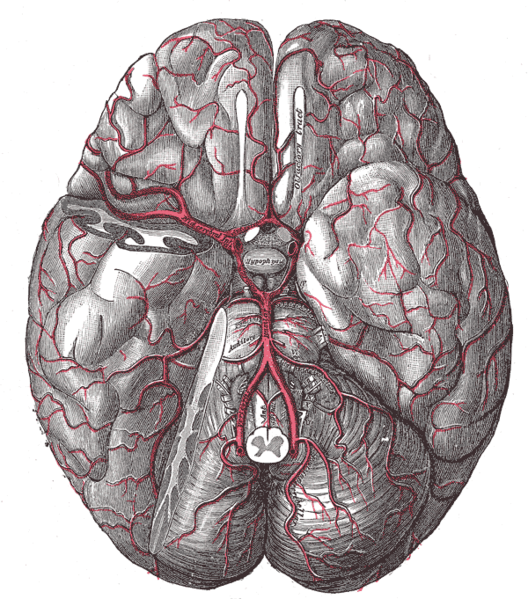 It ascends in the central gutter (sulcus basilaris) inferior to the pons and divides into the posterior cerebral arteries and the superior cerebellar artery just inferior to the pituitary stalk. 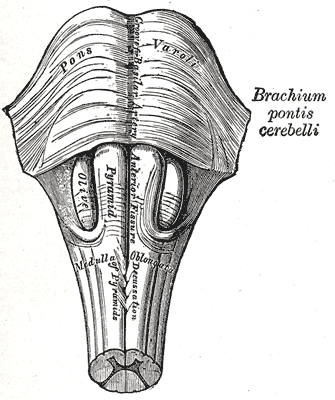 From the basilar artery arises the superior inferior cerebellar artery (supplying the superior and inferior aspects of the cerebellum), as well as smaller branches for the supply of the pons (the pontine branches). 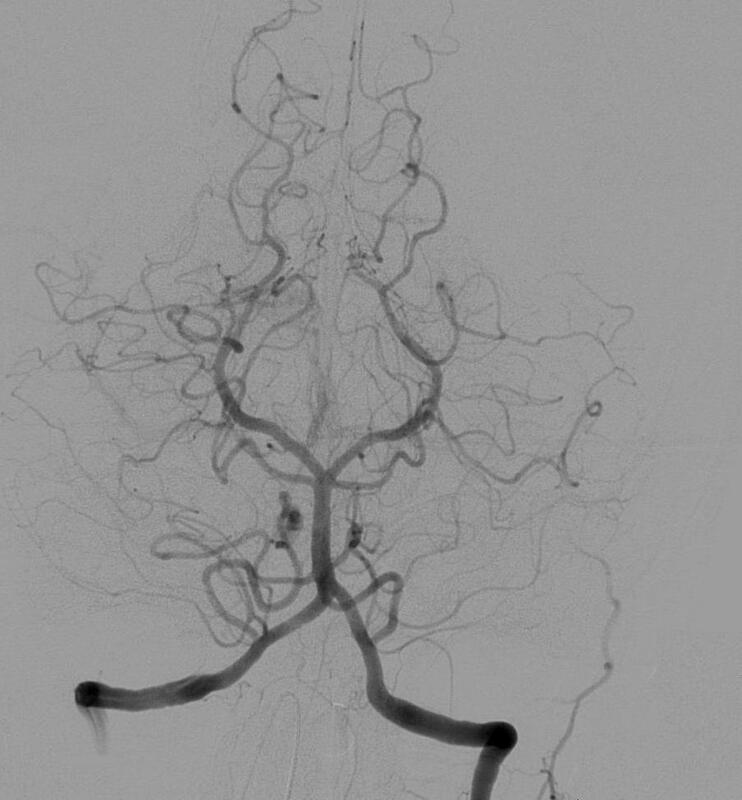 Thrombosis of the basilar artery can be life-threatening, as it leads to hypoxia and ischemia of the brainstem. Poor prognoses are common and these can include paralysis of all extremities, heavy disturbances in sensation, difficulty in swallowing and difficulty in respiration. 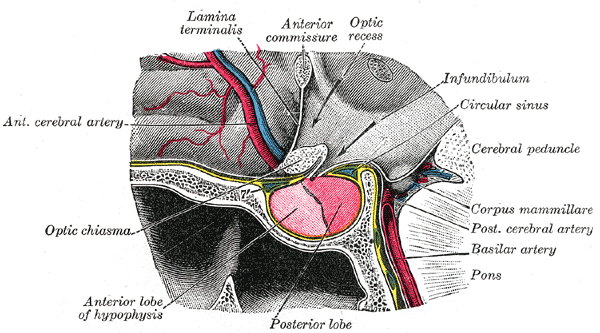 The hypophysis cerebri, in position. Shown in sagittal section. 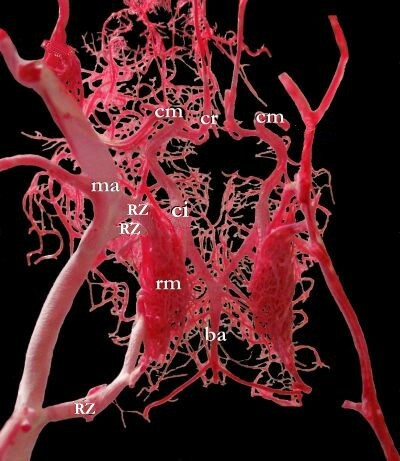 Cerebral angiogram showing the transverse projection of the vertebro-basilar and posterior cerebral circulation. SUNY Labs 28:09-0204 - "Cranial Fossae: Arteries, Inferior Surface of the Brain"
This page was last edited 04:41, 26 April 2019 by Charmaine Patel. Based on work by Alexandra, Cafer Zorkun, Scott Williams, charlesmichaelgibson@gmail.com, Alexandra Almonacid and Jacki Buros (bot), wikidoc user WikiBot and wikidoc anonymous user Nephron.